Ingrown toenail or overgrown toe skin? 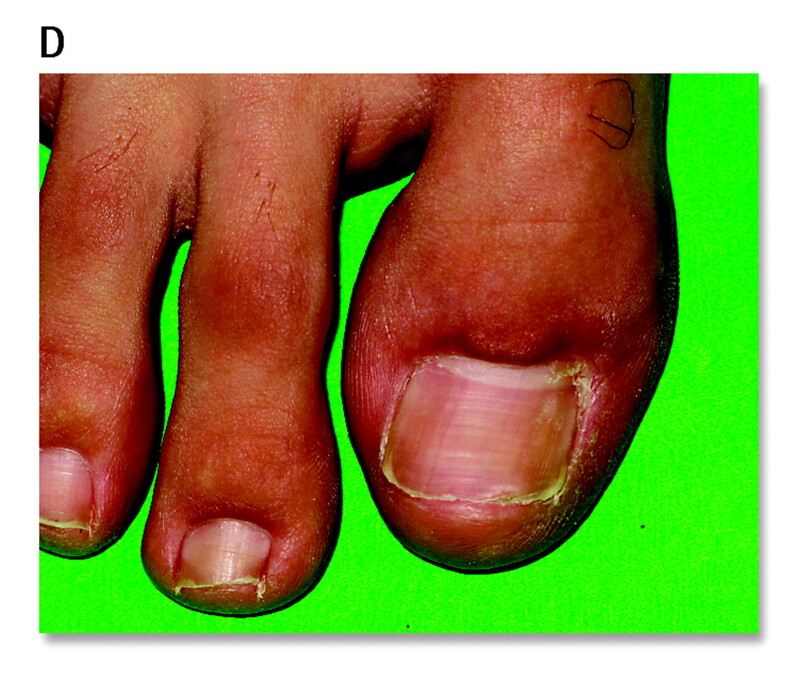 There are currently many surgical options for treating the “ingrowing toenail” (for example, wedge resection, which is demonstrated in this month’s Video Series); however, they tend to have high rates of recurrence, poor cosmetic results, and low rates of patient satisfaction.1 According to a 2005 Cochrane Review, rates of regrowth after the long-standing treatment (phenolization) were 34% for GPs and 50% for general surgeons.1 In 1959, Vandenbos and Bowers noted that patients who developed this problem tended to have an excessive amount of tissue at the sides of the affected nail. They theorized that weight-bearing caused the tissue to bulge over the sides of the nail, resulting in pressure necrosis.2 The Vandenbos procedure (described below) took form based on this theory and now challenges the current paradigm. The Vandenbos procedure is indicated for patients with classic onychocryptosis, most of whom are in their second or third decade of life. It is not recommended for patients with dystrophic nails, fungal infections, or thick, discoloured, curling nails, as seen in the elderly. 2 x 2-inch gauze, gauze roll, and tape. To begin, a ring block is done at the base of the toe with 3 mL of plain 2% xylocaine (1.5 mL per side), and a tourniquet (eg, a Penrose drain) is wrapped tightly around the toe. The toe is cleaned with an iodine wash.
A 5 mm incision is made proximally from the base of the nail, about 3 mm from the edge (leaving the nail bed intact). The incision should extend toward the side of the toe in an elliptical sweep and finish under the tip of the nail, still keeping to 3 mm from the edge. It is important that all skin at the edge of the nail be removed. The excision must be generous and adequate, leaving a soft tissue deficiency of about 1.5 x 3 cm (Figure 1). Light cauterization with a hyfrecator along both the edge of open skin and the subcutaneous tissue of the wound reduces postoperative bleeding and pain. Do not damage the nail bed or matrix as this is a nail-sparing procedure. A fine mesh tulle gauze (10 cm2) is folded and placed directly over the wound. A snug dressing is applied (eg, a roll of 5-cm gauze wrap). The elastic tourniquet is then removed. Keep the foot elevated to help minimize bleeding. Once at home, the patient should lie down with the foot elevated for the first 1 to 2 days. Analgesia should be achieved using acetaminophen with codeine (eg, Tylenol No. 3) and ibuprofen. About 48 hours after the operation, the patient should soak the foot in warm water with 1 to 2 tbsp Epsom salt for 20 minutes, gradually removing the dressing. It is common for minimal bleeding to occur. After soaking, a small dressing should be applied to the wound. This procedure must be diligently repeated 3 times daily while the wound gradually heals inward from the periphery, as it aids the healing and keeps the wound clean. There will naturally be some redness around the wound for 1 to 2 weeks postoperatively; however, antibiotics are not necessary. Patients return for follow-up after 2 weeks to ensure that adequate healing and proper care of the wound is taking place. At 4 to 6 weeks the wound should be healed with the nail above the skin (Figure 1). A) Preoperative toe; B) and C) intraoperative toe; D) and E) healed toe, 4 to 6 weeks following procedure. The Vandenbos procedure is a rational physiologic approach to the problem of overgrown toe skin (onychocryptosis) and yields a curative, cosmetically excellent result. Not surprisingly, patient satisfaction reflects this. For more information, visit www.ingrowntoenails.ca for access to research articles, physician and patient information, photo galleries, and a video of the Vandenbos procedure. You are going to email the following Ingrown toenail or overgrown toe skin?